Tre Wilcox looks like he belongs at the gym more so than in a kitchen. If judging his athletic physique, many are inclined to believe he’s gearing up for a weight lifting competition. But he’s not. He’s a chef, one with a laundry list of accolades under his belt. His “school of hard knocks” training makes his accomplishments all the more impressive. Chef Tre worked his way up the culinary ranks through good old-fashioned blood, sweat and tears. He cleaned chicken in a fast food restaurant as a teenager and by the age of 29, he earned a 5-star review at Abacus where he served as chef de cuisine. Twice nominated for the “Rising Star Chef “award by the James Beard Foundation, which is the “Oscars of the Food World,” Chef Tre was also named Best Chef by the Dallas Morning News. He parlayed his kitchen success onto the small screen by appearing on Bravo Television’s Top Chef season three and Top Chef All-Stars. There was also the Food Network program Iron Chef America, where along with his mentor Kent Rathbun, they beat the team headed by Bobby Flay. He’s been featured in Gourmet, Modern Luxury and Food & Wine magazines, just to name a few. 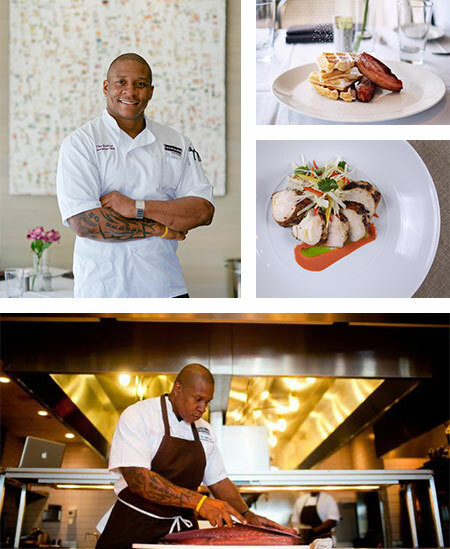 Standing by his belief to use the best ingredients, Chef Tre taps into the many lessons learned while he “staged” in some of the best restaurant kitchens worldwide. Staging is when a chef works in another chef’s kitchen, typically unpaid, in order to gain knowledge. Wilcox explains that he preferred being trained that way, “Instead of working towards a set criteria, which is what culinary school offers you, I stayed with the trends as they were changing.” Since leaving his executive chef position at Marquee Grill, Chef Tre has found much success and satisfaction from teaching classes and catering events. 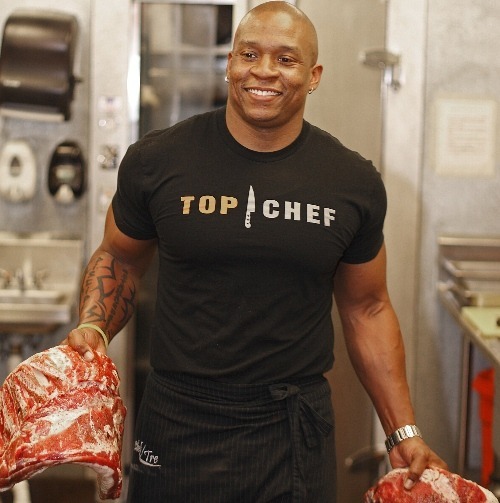 In 2005, Chef Tre noticed he was packing on extra pounds. Not wanting to get comfortable with his expanding waistline, he challenged his kitchen staff to a weight loss competition. He believes being in shape is key to keeping up with the rigors of running a busy kitchen. He won the challenge. “A lot of times if I’m not in the kitchen, I’m in the gym.” Never one to use his career choice as an excuse to gain weight, Chef Tre proudly calls himself a “gym rat.” His belief in supporting healthy lifestyle choices has led to partnerships with organizations like United Health Care, The American Heart Association and Equinox Gym. In his down time, Chef Tre can be seen around town, dining at various restaurants with his daughter. Quite often referred to as his “sous chef,” he is passing his love of food and cooking onto her.